It’s been a long week for journalists in Indiana. After working some crazy hours, escaping to Indy for an evening was the perfect way to unwind. We had tickets to see Shakey Graves at the Murat with some friends (he was even better live than on vinyl) and decided to head up early to grab dinner at The Rathskeller. James had been wanting to take me there for a long time — he majored in German and loves their food even more than their language! The atmosphere alone is amazing. The restaurant is in the basement of a beautiful, historic building that used to serve as a German community center. It’s absolutely huge and has a great space available to host large events. I’m not really a meat-and-potatoes gal, but James encouraged me to try some traditional German cuisine. It did not disappoint. Pro tip: eat light meals earlier in the day if you plan on enjoying this restaurant. 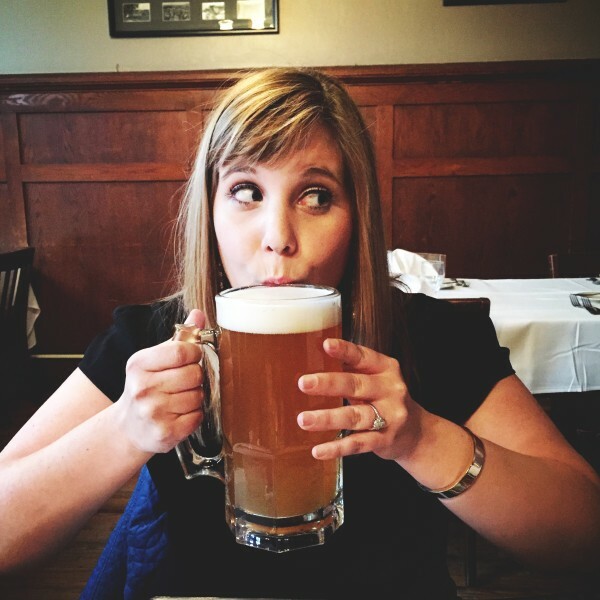 And, don’t make the same mistake I did and order the 32 oz. beer — I was full by the time our main course arrived. I started my meal with a salad, topped with their warm bacon house dressing. I don’t usually like bacon, but this was phenomenal. They also bring out a bread basket with a freshly-baked pretzel. It was delicious, but be careful with the mustard — it contains a lot of horseradish. 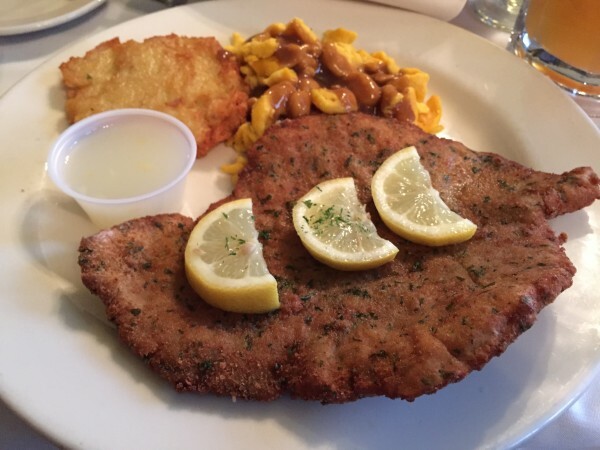 For my entree, I followed James’ lead and ordered the exact same thing he did: traditional schnitzel, spaetzle and a potato pancake. That photo doesn’t accurately represent how gigantic that piece of meat was. Between the potatoes, pork and beer, how on earth do Germans stay so thin? I would highly recommend the schnitzel. I doused mine in lemon juice and loved every bite. The potato pancake was excellent, as well. I’m not a huge fan of gravy, so I didn’t love the spaetzle. But, that was James’ favorite part of the meal. 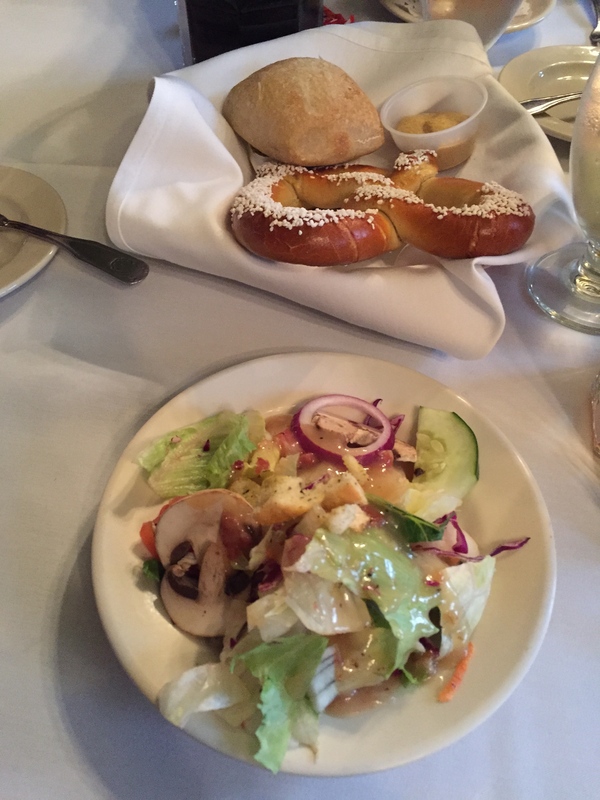 The Rathskeller is conveniently located right across the street from the Murat, so it’s a great place to grab a bite before a concert. I can’t wait to go back when it gets a little warmer so we can enjoy their outdoor beer garden!